To celebrate the first sailings of the Costa neoRiviera’s Mediterranean season, Costa has arranged with their partners, the University of Gastronomic Sciences of Pollenzo, a Mediterranean food and wine festival aboard the selected sailings. The event will give passengers an opportunity to learn about the food products of the region in which they are sailing. It happens every few years. The media gets all hyped about Virgin Group Founder Richard Branson entering the cruise industry. It’s that time again, with Britain’s Sky News today reporting this year’s version of the story. The Italian news agency ANSA reports that there was a measles outbreak aboard Costa Pacifica during its current Mediterranean cruise. Carnival Corp said this morning that Micky Arison will sell up to 10 million shares of Carnival Corp representing up to approximately 1% of the total combined voting rights of the company. Arison said he is selling the shares "for tax planning, estate planning and diversification purposes." Five million of the shares were sold this morning at a price of $39.50. The remaining five million will be sold over the next 15 months in accordance with SEC rules. Even after the sale of the 10 million shares, the Arison family and related entities will still control approximately 188 million shares of Carnival Corp, which is approximately 24% of the combined voting rights of Carnival Corp.
Overnight, Azamara canceled the March 3 sailing of Azamara Journey from Shanghai. 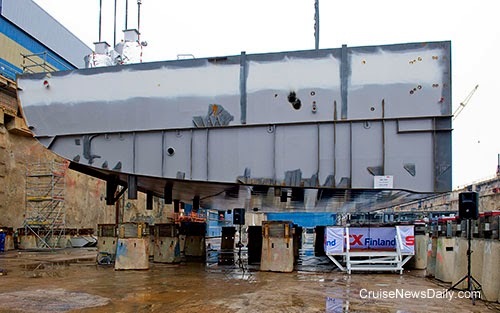 While the ship’s repair plan won’t be finalized until Friday, it was obvious, repairs couldn’t be completed by March 3 and will take well into to the time frame for the 14-night cruise. The line does, however, feel confident they will be able to have the ship repaired in time for following sailing on March 17. Royal Caribbean International will be sending two Radiance-class ships to Alaska next year, offering both types of itineraries. CND subscribers also read about a disturbing trend ... and something they never thought of in the '60's. Wednesday afternoon (February 26, 2014) the Coast Guard received a call from Carnival Paradise which was en route to Tampa saying they had a 66-year-old man suffering from a medical issue, and they were requesting assistance with transporting him to a shoreside medical facility. The Coast Guard dispatched an MH-60 Jayhawk helicopter crew from the Coast Guard airstation at Clearwater, Florida. The rendezvous point was some 180 miles southwest of Marco Island, which was nearing the outside range of the MH-60. Carnival Paradise speeded up get within range and facilitate the medevac. Upon arrival over the ship, the helicopter crew lowered a rescue swimmer to the deck of the ship and then, as shown in the video below, hoisted the patient to the helicopter and transported him to a Tampa hospital. Carnival Paradise returned to Tampa this morning, and now other passengers' are talking to the local news media alleging that after the man collapsed yesterday of an apparent heart attack, Carnival crew members were slow to call medical personnel, none of them administered CPR and it took an extremely long time for the ship's medical personnel to arrive on the scene. Carnival told CND in a statement today, "Similar to land-based venues, all Carnival ships have an emergency response system which was utilized in this case aboard the Carnival Paradise. The shipboard medical staff arrived on site as rapidly as possible with portable lifesaving equipment and immediately began administering aid to the guest." That portion of the story is still developing. After the man was airlifted to the Tampa hospital, local media is reporting that he died there. 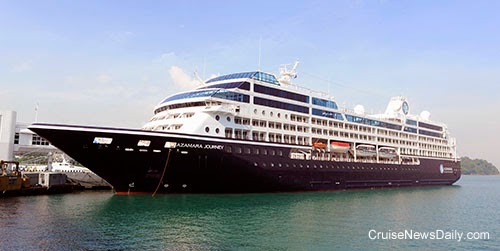 Azamara has canceled the March 3 sailing of Azamara Journey from Shanghai. The cancellation stems from the February 25 incident with sea debris near Tokyo which damaged one of the ship's propellers. Immediate repairs are necessary. Azamara is now in the process of contacting passengers on the affected sailing. Passengers will receive a full refund and a future cruise credit of the fare they paid for the March 3 sailing. 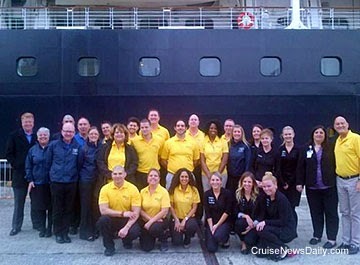 The complete story will be in today's edition of Cruise News Daily. It was a rough ride yesterday (February 25) into Tokyo for Azamara Journey. The command noticed the unusual vibration. Upon arrival, they made a closer inspection and found damage to one of the two propellers, caused by ocean debris, including some wires that were wrapped around the propeller. The ship is now sailing to Osaka (Kyoto) at a reduced speed and will arrive on Friday (February 28). The cruise will end there due to the required repairs. Have you ever wondered what it would feel like to fall off your balcony? One very lucky lady who sailed aboard Carnival Miracle last week can tell you. The 27-year-old woman fell from her balcony as the ship was sailing to Mexico, and she landed on top of a lifeboat three decks below. Jamaica may be ready to follow Colorado’s lead. According to one parliamentary leader, he believes small amounts of marijuana may be decriminalized on the island as early as this year. Photo courtesy of Azamara Club Cruises. All rights reserved. May not be copied or used without permission. STX Finland laid the keel for TUI’s Mein Schiff 4 at their Turku yard today. 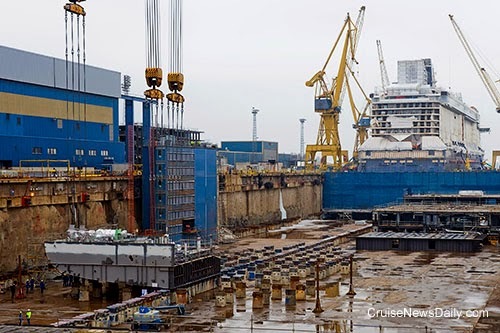 The ship, which is a sister to Mein Schiff 3 that is also under construction at the same yard, will enter service already in the spring of 2015, with bookings opening on March 12, in just over two weeks from now. A few more details came out today in federal court about the brutal attack on a passenger aboard Holland America’s Nieuw Amsterdam two weeks ago. The hourlong proceeding was a bail hearing for the 28-year-old former room service steward who is alleged to have attacked the 31-year-old woman. The additional details that came out only made the story more grim. Photos courtesy of STX Finland. All rights reserved. May not be copied or used without express permission. Norwegian Cruise Line has just begun work on their dedicated cruise port in southern Belize, and now a developer in Belize City is moving forward with plans for a large port on an island adjacent to that city. The island will be linked to the mainland by a causeway, eliminating the need for the tender ride which is now required from most ships calling at Belize. Last week, P&O decided Oriana would return to Southampton three days early this week, on Wednesday of this week, for repairs to the seals on its two propeller shafts. The Port of San Diego switched on shore power for cargo vessels today, completing its project to provide all ships the opportunity to plug in rather than running their engines while in port.